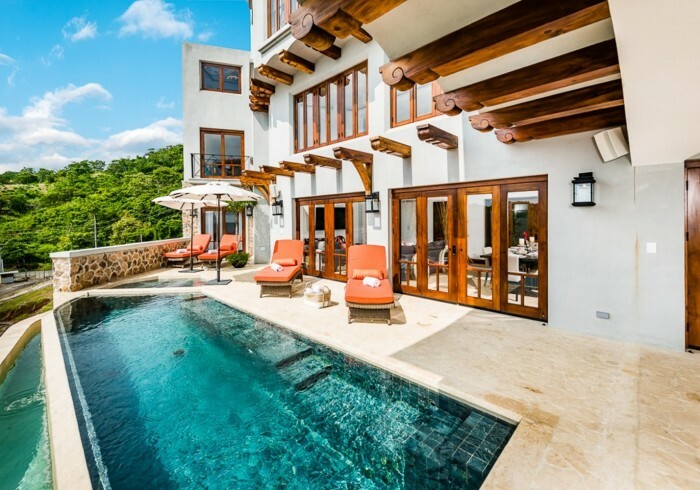 Villa del Sol is a 4-bedroom, 5-bath home that sleeps 12 with stunning ocean and sunset views, an infinity edge pool, seamless indoor/outdoor open-plan living and a roof deck. An open floor plan with 25’ ceilings flows to a covered BBQ terrace, infinity-edge pool and heated spa. This space is perfect for a get together with plenty of seating, comfortable oversized furnishings and unparalleled views. The penthouse master encompasses the entire 3 rd floor and has expansive views, a private balcony and a relaxing lounging area. The master bedroom’s en-suite bathroom is elegantly decorated with marble floors and counter tops, dual vanity, separate his/hers toilets, a huge shower with 3 shower heads and a freestanding soaking tub. The second master suite has a king bed and a private terrace with stunning beach views. The en-suite, ocean view bathroom has dual sinks and a shower with 2 shower heads. The versatile third bedroom has 2 twin XL beds that can convert into a king bed. The gorgeous fourth bedroom, a bunk room with direct access to the pool, sleeps 6 in 2 king beds and 2 twin beds. All bedrooms have high quality linens and bedding, luxurious mattresses, private en-suite bathrooms, air conditioning, ceiling fans, 55” flat screen TV’s, Bluetooth speakers, WIFI, and ocean views. Villa del Sol is one of the few properties in Las Catalinas with a garage and is just a 3-minute walk to the Beach Club and a 5-minute walk down a path to the beach. All furniture imported; specially designed for socializing and relaxing with family and friends. The home also comes with a House Mom signature service. Daily Housekeeping. Concierge Service. Beach Club access. Attached Garage. 24-hour Security. Trail access. Toiletries. WIFI. Ocean View. Beach view. Pool. Heated Spa. Netflix. Sonos sound system.